Cook linguine for 10 minutes in boiling water, drain and keep warm. Meanwhile, combine broth, soy, vinegar, pepper and cornstarch in a bowl. Heat a wok or heavy skillet over high heat. When very hot, add 1 tablespoon oil. Add chicken and stir-fry until lightly browned, about 2 minutes. Remove from wok and set aside. Add remaining oil, onions, garlic and ginger; stir-fry 30 seconds. 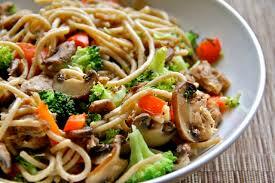 Add broccoli, mushrooms and carrot; stir-fry 2 minutes. Lower heat to medium and simmer until vegetables are tender, about 3 minutes. Toss with linguine and serve.